The recent testing of an AI chatbot created by a medical software start-up is an apt instance demonstrating the developments in chatbot market. Tested by the Royal College of Physicians of London and found to be more accurate than general practitioners, this AI chatbot is on its way to making inroads in the chatbot market. Reportedly, while general practitioners have scored an average of 72% in the MRCGP exam, a final test for trainee doctors, the chatbot by Babylon Health scored over 80%. This result presents a moment of big triumph for the chatbot market, the technology involved in which has been changing the face of various industries and has been estimated to save billions across various business verticals. Babylon Healthcare’s chatbot is only an example of how the healthcare system can be changed with technology to be made more accessible and affordable not to mention, correct diagnosis. According to statistics presented by the World Health Organization, there is shortage of approximately 5 million doctors worldwide. More than half of the world’s population does not have access to basic healthcare facilities while primary healthcare is largely unaffordable or inaccessible to many – a fact that may provide a major impetus to chatbot industry, as per experts. The National Health Service of the United Kingdom has been increasingly trying to employ means to adhere to the healthcare budget of the nation while serving citizens across a wide socio-economic stratum with adequate health advice and facilities. The NHS reportedly pays each consulting doctor $80 per patient, while paying the same amount to Babylon. But many people use Babylon’s services after physical clinic hours and during the night. A night or emergency visit to the hospital would cost a patient nearly $130 which is more than what Babylon charges. Thus, ultimately NHS is saving money all the while offering a better service with shorter waiting time to patients. It is rather overt therefore, that chatbots will ensure the future of healthcare services, making the medical sector a vital growth ground for chatbot industry. The lure of financial benefits has encouraged sectors such as BFSI, retail and e-commerce to largely adopt chatbots. While the Bank of America already has its chatbot Erica, Bank of Montreal has followed suit with Bolt and Capital One boasts of Eno. Banks are competing with other businesses to adopt chatbots as latest research is increasingly pointing out the benefits of adding a virtual assistant to improve customer service and reduce customer wait time. As per estimates, by 2023 chatbots can save more than $10 billion for banks. In 2018 alone, the savings figure can surpass $6 billion. Chatbots not only help customers by cutting response time but also free bank employees from routine tasks of tackling simple issues that an AI assistant can easily handle. For instance, the French bank, Credit Mutuel, is working with IBM to adopt a chatbot that can free employees from having to process more than 350,000 emails every day. The chatbot market is thus receiving a cumulative impetus through businesses that are looking to use human employees in a more efficient manner while delegating routine work to be handled by capable artificial intelligence tools. Chatbot industry is not profitable only because technology has exponentially evolved to make it possible to drastically revolutionize customer service but also because the new generation of customers prefer chatbots over other means of communication. The “millennial” generation which now makes up for a bulk of customers, has been brought up in a culture where text messages and emails prevail over phone calls. As a result, the millennial generation has demonstrated an aversion to phone calls and according to prominent research the phone app is only the fifth most used app in a smartphone. Younger customers are much more comfortable with technology and prefer the texting interface to have their queries resolved rather than to make phone calls and interrupt a busy schedule by waiting to be transferred to a customer service agent. With 68% millennials having admitted to text excessively throughout the day, businesses are catching up on the trend and are deploying chatbots as more effective means of customer service than a human tele caller, thus adding impetus to the chatbot market. One of the sectors that has registered major growth with the deployment of chatbots is the e-commerce industry. A chronic problem that the e-commerce industry has been plagued with since its inception is the case of the “abandoned cart”. Estimates show that almost 70% of online shoppers abandon their carts before they complete their purchase. The case is even more evident for clothing retailers who have routinely recorded that in spite of browsing extensively through their websites, customers often prefer to go to brick-and-mortar locations and even tag along a friend to make purchasing decisions. Recently, outdoor wear producer, The North Face, has partnered with IBM to create a chatbot that would improve customer experience and incorporate AI that can chat with a customer to create a psychoanalytic profile with the data provided by the customer. The chatbot even asks about the occasion for which the clothing is being bought and creates matches that helps shoppers skip the hassle of scrolling through hundreds of products. IBM has recorded that customers are spending more time with AI and 60% are clicking through rate for product recommendations. With chatbots finding a means to reign in the runaway customer, more e-retailers are bound to improve their business with the adoption of the technology. It comes as no surprise therefore, that e-commerce accounts for 35% of the overall chatbot industry share. 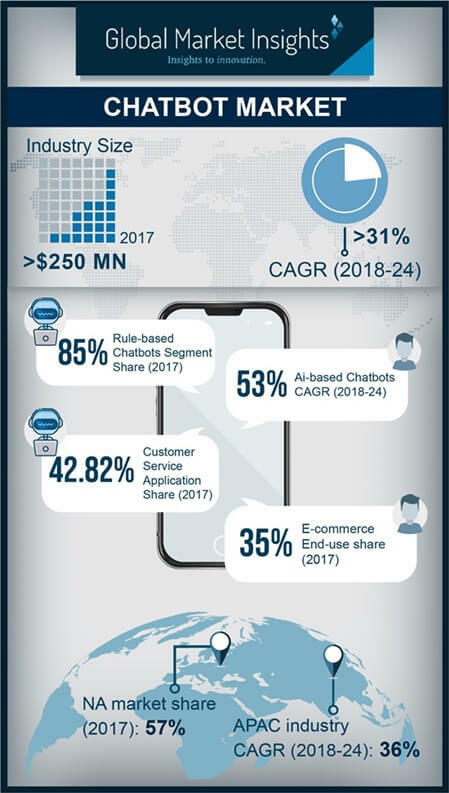 Powered by the incredible benefits of chatbots in retail, such as 24/7 availability, better customer interaction, reduced expenses, and online store management capability, chatbot market size from e-commerce applications is expected to register a CAGR of 34% over 2018-2024. Chatbots have been able to demonstrate exponential potential due to their ability to scale. Estimates show that between 2016 and 2018 number of people using messaging apps is anticipated to increase from 1.6 billion to over 2 billion. By these estimates 80% of smartphone users will be using messaging apps in 2018. Not too far back in the past, Facebook had invited other companies to collaborate and use the Facebook Messenger app to integrate their existing app. Numerous companies took the opportunity of riding the wave of Facebook Messenger’s success and engaged a huge audience in using chatbots. The movement urged the creation of thousands of chatbots that added a major stimulus to the chatbot market. According to analysts, chatbots will soon have the potential to replace the search window. There has been a rapid decline in app usage and more brands are inclined to use chatbots than just mobile friendly websites and apps. While it costs less for brands to use chatbots than hire and train customer service agents, customers prefer a brisk message interaction over talking on a phone with a person in a call center. The customer service segment is therefore anticipated to garner a commendable share in chatbot market by 2024. Indeed, customer service applications account for 42.82% of chatbot market share. Estimates claim that more than 85% of customer relations will be handled by artificial intelligence by 2020, impelling chatbot market outlook industry from customer service applications. Powered by a highly fast-paced life governed by technology, customers want businesses to be available 24*7. Chatbots have made it possible to provide such round the clock service and hence people-to-people conversations are fast being replaced with people-to-bots interaction. Aided by the massive penetration of these tools across a slew of verticals, chatbot market, having registered a valuation of USD 250 million in 2017, is poised to become a billion-dollar business by 2024, with a target revenue of USD 1.34 billion.